By nature, rabbits are very social creatures. That's not to say that a single rabbit won't be happy. As long as you bond strongly with the rabbit, he or she will likely be very happy. However, nothing is more heartwarming than seeing two bunnies cuddle. A long eared friend for your rabbit might be just the thing they need if you are gone for long hours during the day, or if despite your best attempts they seem bored or lonely. When people who already have a rabbit in the household want to adopt a bunny friend from our group, we often start out with a "bunny date." This is where the existing rabbit is taken to meet the new rabbit, and the two are introduced on neutral territory (that is, an area that neither is familiar with or has "claimed"). General introduction to introducing rabbits. Every rabbit is an individual, and on top of that simply has his moods. It's important to remember that what happens on the first date can be unpredictible; the rabbits may ignore one another, or they may attempt to fight. Also, one meeting doesn't say much about the future of a relationship. 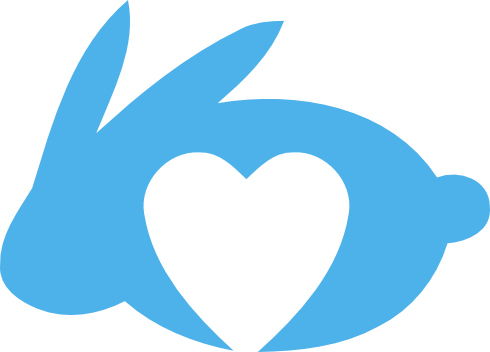 For instance, very docile, sociable rabbits can decide upon first meeting that they want to fight with the new rabbit, but after a more slow and deliberate adjustment period, may fall in love! A "bunny date" just lets you know where you're starting from. If the rabbits ignore one another or seem very comfortable with one another, you can continue with frequent supervised "meetings" once they are both in your home. If they attempt to fight, you'll want to start with a more conservative approach, such as by placing their enclosures close to one another where they can see one another, but not interact. 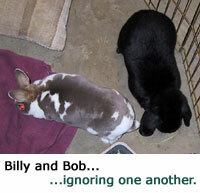 This picture is of Billy, the mini-rex friend of Amy, and Bob, one of the Harrodsburg rescue rabbits. Scott (Amy's husband) had fallen in love with Bob, and the hope was the the two would bond and be able to move in together. the first meeting was very low key, so all looks promising! The picture to the right is Karen with her two darlings, Hope and Bailey. They've come to meet Faith (the black and white bunny) for the first time. The hope is that the three will get along together. The initial meeting went very well! The key when bonding is to be patient, and be positive!